Graffiti culture is an urban, male-dominant sphere. Most popular graffiti work has been associated with New York City, where from the 1970s, youth-dominant “hip-hop graffiti” emerged as a means of “ghetto expression” of urban culture (and urban decay). Graffiti continues to be a means of “doing art” with explicit knowledge of its legal precautions, a.k.a. it’s now allowed. That is probably what makes graffiti a popular form of expression– you are not supposed to spray paint public and private properties with images that denounces social norms, or things we are uncomfortable about. It is not wonder that some of the best graffiti art work has been associated with revolutions (e.g. Berlin Wall). With the uprisings that continue to take place in North Africa and the Middle East, the graffiti scene has been of particular interest to me because 1) they are quite beautiful and 2) a lof of them are being taken up by young women. I first observed the work online more from an artistic point of view; I have always been fascinated by female artists from the Arab region because inevitably, politics and their ownership of their bodies are always tried to it. 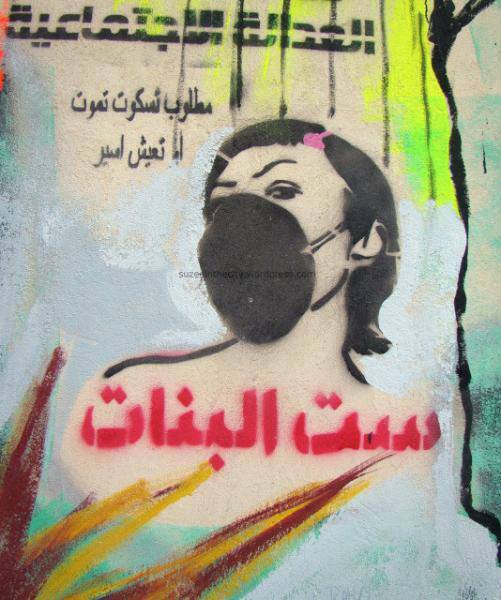 Here, it is without saying that the graffiti work by Egypt’s young female artists are, is, and will be political. Mostly, what draws my attention to Cairo and Alexandria is the fact that these are young women expressing their work in a male dominant sphere, challenging the notion of femininity and what it means to be a woman in society, at large. Graffiti has always been a male dominant area. New York City’s subway stations carry some of the best work, most, if not all, completed by young men. It is without saying that even in America, men are the artists who get to carry the spray pain and dictate what goes on those abandoned walls. It is not a East-West, North-South thing. Egypt, like many of its neighbors, is a region where female expression has been indirectly silenced. Of course, women have been a big part of the revolution. Their voices continue to matter and they are not being directly silenced (as they are in the Gulf regions, for example). 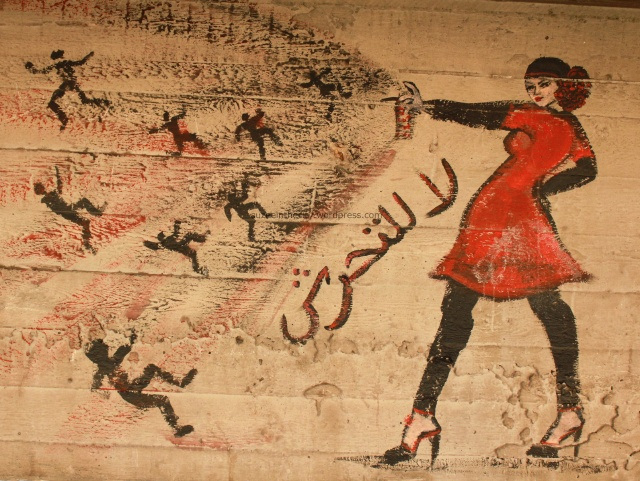 In an area that has historically and repeatedly limited the development of female expression, combined with a very strong patriarchal culture embedded along all social lines, the work of anonymous female Egyptian artists in Cairo’s walls are invaluable. It’s public. It’s contemporary. It’s words/things we still don’t like to throw around. It’s maybe even a way for Egyptian women to take agency of their bodies and their place in heated politics. It’s political. Please check out Women on Wall, an artistic campaign and collaboration that took place in Luxor, Mansoura, Cairo and Alexandria to use graffiti art to express the female agency and empowerment. (womenonwall.com).